Alright, stop sniggering in the back there. That's hookah with a –kah. We've all seen them at the airport. You've got to take it as hand luggage 'cos it's so darn fragile. Or if you are a single woman, perusing the strip from the Camel bar onwards and the good looking Arab boys whisper "come smoke hookah with me and I will teach you the ancient history of Naama Bay resort area..." (this would be a five minute monologue on the invention of the breeze block). Yes indeedy, wherever you go in Sharm the ubiquitous hookah pipe will be offered to you to buy/smoke or stick somewhere if you don't take up the former suggestions. But before we go any further, let's get the nomenclature correct. In actual fact in Egypt, west to Morocco and south to the Yemen via Saudi it is called a Shisha. This is from the Persian shishe meaning glass. Hence the bubble wrap on purchase. If you are hanging with your Hezbollah homies in Beirut, a Halliburton employee in Baghdad or even a 55 year old divorcee trying her luck on Cephalonia with a local fisherman, then you'd best call it a narghile. And if you were a Royal Naval hostage of the Iranian military, and had chugged off the last of your duty free, you would have to ask your captors for a gheyloon. (But then you wouldn't have to worry as you knew deep down that Margaret Beckett, Foreign Minister extraordinaire would come and save you asap. Notmuppetess). The term hookah actually comes from huqqa, its term in India and Pakistan. Which makes you wonder what letters they have in their Scrabble games? Not many U's I reckon. Hash pipes, bongs and hubbley-bubbleys should be terms kept away from true users and left in the lyrics of Californian teen anthems. 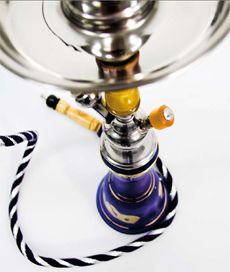 Hookahs are purported to have originated in India. But we have the mighty Ottoman Emperor Murat IV to thank for spreading the popularity west. He brought it to wherever the Ottomans were invading in the 17th century, and it went farther west and south the century after. So now you've got one up in the hold on your flight back home. Whaddya do with it once you are back in Bromley? Throw an Egyptian themed dinner party of course. Don't forget the rancid wine with an obelisk on the front. There are seven crucial parts to your smoking experience. And not sounding too much like a visit to a mechanics, you've got the bowl, hose, plate, water jar, body, gasket and valve. Stick 'em all together, put in the shag and your hookah is ready. The most important elements though are what you smoke and how you get it to burn. Contrary to popular expectation, the hookah is a drug free zone. Apple tobacco is the Number 1 smoked substance worldwide. If you are a non-smoker then there are tobacco free products made by Soex that are basically fruit pulp with honey or molasses to extra sweeten the taste of the smoke. However, the hit you'll get in Sharm is about a 50/50 combo of tobacco with whatever fruity taste you want, along with a bit of nicotine free honey, molasses or treacle. If you don't like apple, go for vanilla, coconut, strawberry, cherry, mint or even cappuccino. It's like ice cream really, and kids will love it. (No don't! However a recent law has been passed in Iran banning its use in the under 14's– no wonder they all seem so angry over there when I watch Sky News). You can make a cocktail too, if you are so inclined. Mixing strawberry and banana is the best. I call that "1001 Arabian Nights", though my respirologist preferred "Pulmonary Meltdown" due to the colour of my sputum. Getting it burning is the real key, and as all we British Barbie blokes know, you can't just chuck a gallon of diesel on it and step away from the flame. You need teeny pieces of charcoal. The idea is to have 4 pieces alight, around the edge of the bowl and preferably separated from the tobacco with pierced tin foil. The point of this is to roast the 'baccy and not to burn it. If it burns, no amount of water can filter the harsh taste. So start the charcoal off on the rim, and pull and puff a bit to get it all going. I would suggest getting the diver with the best air consumption round to do this part. Throughout your session as the charcoal fades, move the pieces towards the middle of the bowl and you'll get an even smoke for the 2 hours that a hookah session can last Then you are away. Ah! I hear you ask– what about hookah smoking etiquette? Here's how you do it. When you have finished your go– either place the hose back on the table to show it's now free or pass it to the person next to you, but NEVER mouthpiece first. Fold it back on itself so you pass it with the hilt, so to speak, of the hose to the next smoker. Failure to do so will cause as much offense as exposing yourself whilst doing the best man's speech. Having received the hose, it is also customary to slap the giver on the back of their hand as a sign of friendship. Once you have gotten used to the whole process, you can start to get a little bit funky. Tips include jazzing up the water that you put in the jar at the bottom. Some add a little rosewater, some a little orange juice to sweeten things up. And I have even heard of the jar being filled entirely with milk. Though this could have been the Persians before the under 14 ban. Between sessions, always clean out the hose, the bowl and replace whatever liquid you have in the jar. You are never alone as a hookah smoker. In today's world we do need celebrity endorsement of everything we do. So step forward, gorgeous clothes designer Stella McCartney, Margate contemporary wild-thing artist and burned love-tent creator Tracy Emin as well as 90's parklife popster Damon Albarn. And from across the pond Charlize Theron, who only seems to have naked links on the Web, coupled with none other than Dubya's twin daughters Jenna and Barbara. "If we're gonna invade Iraq honey, at least we can get the kids to kinda empathise with them..."
And from the pond itself, that caterpillar out of Alice in Wonderland along with Christine Hamilton. Yes, seriously folks. If you haven't already been ripped of in the neo-souks of Naama Bay then what should you pay for a hookah? A quick whiz around the web shows that they really do vary in price and that there is no real yardstick. A standard singlehosed pipe goes for £15 to £25. What makes the difference is the quality of the glass jar as well as the hoses. Cheap thin glass with a standard fluffy hose is at the lower end of the spectrum. But with thicker glass and a leather pipe or pipes (as you can get up to six of them snaking off the hookah), you should pay up to £40, unless of course it's "first deal of the day, I like you, my cousin lives in Liverpool – is that in London?" where you will be suckered into paying more. The purist will go online to find the best, and there are no better purveyors of hookahs than hookah-shisha.com. You can also call them in the States toll free on 866.HOOKAHS. Go up to $350 and you've got the Mya Dynasty with full on "Bohemian Crystal" bowl. But shell out $600 and you can be the proud owner of "The Sultan". "Standing seven feet tall the Sultan is the largest hookah pipe available in the world. If you wanted to stake a claim that you own the largest hookah pipe in the world you can with the Sultan. This hookah pipe is a fully functioning three hosed hookah pipe but also doubles as a beautiful decoration piece for your home or advertisement for your business. It makes quite the conversation piece."